Looking for stylish, cosmopolitan clothing in Indian handwoven fabric? Brass Tacks is your answer. The brand is a successful marriage of tradition and modernity: natural, locally sourced textiles are transformed into fashionable western silhouettes perfect for both everyday wear and the occasional special night out. Clean cuts in breathable cotton, textured khadi, and buttery silks, strong, bold silhouettes and a focus on tailoring and perfect finish ensure the clothes remain timeless, versatile and durable. Perhaps most importantly, Brass Tacks is committed to creating clothing that does not merely conform to the universal standard size chart, but which celebrates the diversity of body size, shape, and type. With its focus on using a natural fibre, handcrafted processes, working with craftspeople engaged in traditional textile-making and weaving, and ensuring minimal use of chemicals and electricity, Brass Tacks lives by its goal – to be a part of the sustainable, slow fashion movement which celebrates indigenous craft, local artisans and reusability. And despite being a decade old, Brass Tacks continues to create fresh, modern, universally-flattering, versatile clothing suited to women of different ages and stages in life. Apart from khadi dhoti pants, well-cut tops, soft, flattering wrap shirts, and linen jumpsuits, the store also has nostalgia-evoking boxy phirans, contemporary-chic saree blouses, stylish dresses and comfortable trousers on offer. 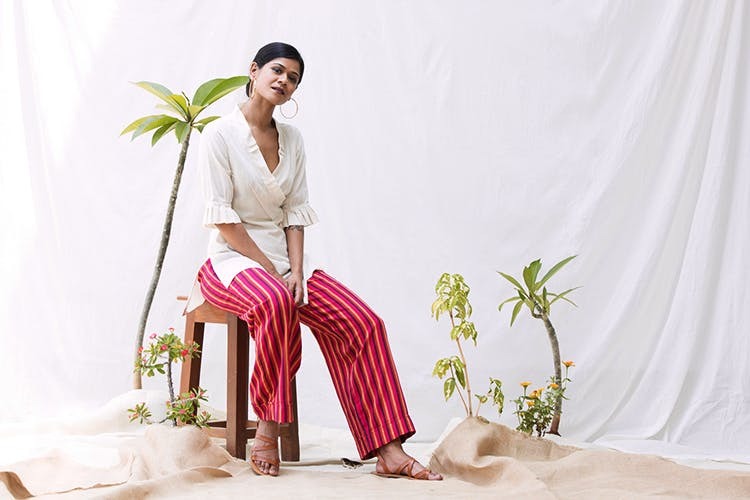 For this year’s summer line, Brass Tacks worked with weavers cooperatives from Andhra Pradesh’s East Godavari belt, an area famous for its rich textiles that are luxuriously soft, and which age with grace. Visit the store for some breezy, cheerful and relaxed pieces perfect for the summer – fit-and-flare dresses, bias tunics, wide leg pants and slip-on culottes in earthy eggplant, rust, teal, and ochre colours.